PMP aspirants are increasingly using Mind Maps for their exam preparation. I came across a very elaborate Mind Map (created using MindMeister) that covers all processes in the PMBOK Guide along with their Inputs, Tools & Techniques, and Outputs (ITTOs). Unfortunately, it's a bit outdated in that it's based on PMBOK Guide, Third Edition. I'm sharing it to highlight the possibilities. I wish someone can download it, re-import it as a new Mind Map and update it to align with PMBOK Guide, Fourth Edition. It could be elaborated further to include descriptions of each ITTO. Take a look at it and see how you can use it. I have one prepared just with ITTO (not much descriptions or relations) with PMBOK Guide Fourth Edition. Let me share in the same site. Thanks for uploading the Mind Map. 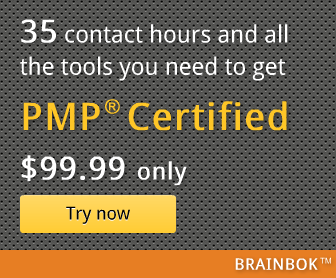 I'm sure it will come-in very handy for people preparing for the PMP Exam. I'm going to share it as today's tip. I'm a regular reader of your blog and appreciate the great work you are doing. Do stop by whenever you can and add your inputs, tips, and suggestions. Just I would like to share with you PMP mind map & PMP ITTO based on PMP Book 4th Edition. I used them and they are helpful. Your map is same as http://www.mindmeister.com/40487908. How I can download your map?